All this hands-on activity, Bailey believes, “makes the trip more memorable.” Bailey recently joined Days of Taste, the signature program of TasteWise Kids, a local nonprofit that introduces children to the world of food and its sources. 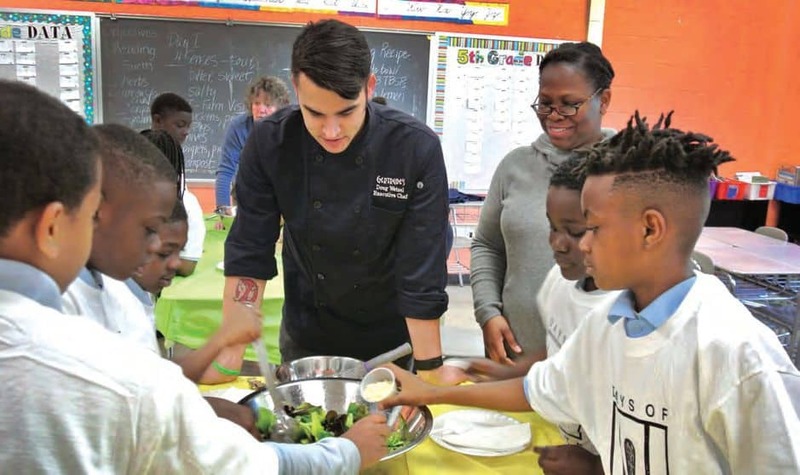 Days of Taste began in Baltimore City schools 20 years ago and currently serves more than 3,000 children throughout Baltimore, Howard and Harford counties. TasteWise kids mix a salad with Doug Wetzel, chef at Gertrude’s restaurant. The three-day program starts in the classroom where a professional–and often well-known–chef explores taste sensations such as salty, sweet, spicy and sour, with the fourth graders. The group discusses how delicious and nutritious food can go hand in hand with good health. On the second day, students take a field trip to a farm to see how vegetables and animals are raised and how food makes its way to their tables. The program concludes in the classroom on day three, when the chef helps students prepare a salad and make salad dressing from scratch, using ingredients from the farm. TasteWise Kids is also working on a fourth phase of the program, sending each student home with a salad kit so they can share what they learned with their families. If you don’t happen to be a fourth grader, you can experience the collaboration—with a little friendly competition thrown in—at the annual Farm to Chef fundraising event, held in September. Each chef is paired with a farmer, who provides ingredients for a dish that is later judged by a committee made up of government officials, media, educators and local celebrities. One year, Bailey was paired with Bruce Clarke, chef at what was then Laurrapin Grille in Havre de Grace. “Bruce asked about red-yoked eggs,” says the farmer, who accomplished the mission by adding red peppers to some of his chickens’ food. “It isn’t harmful to the egg layers and produces quite the reaction when folks see a yoke unlike any other,” Bailey laughs.